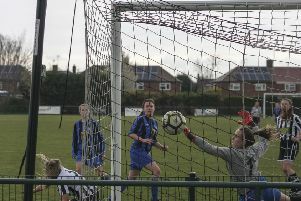 ROUND-UP: Great news for Sports from Holbeach, Yaxley and Stamford! Gary Gibbs (stripes) scored for Peterborough Sports Reserves at Holbeach United. Peterborough Sports FC have probably had worse nights (May 2). While the first team were lifting the Hinchingbrooke Cup in Yaxley, the reserves were taking a giant step towards the Peterborough Premier Division in Holbeach. Goals from Jack Barron and Gary Gibbs secured a 2-0 win for the city side who were further boosted by a 4-2 defeat for second placed Pinchbeck United at Stamford Lions. There are three games left for Sports to secure the three points they need to make certain of a first Premier Division crowd, although a vastly superior goal difference means two points would be enough. Sports might even be crowned champions tomorrow (May 4) if Pinchbeck are beaten at Ketton. Sports have been performing like champions since suffering a shock defeat in Leverington on April Fools Day. They’ve won all eight games since and kept clean sheets in their last six. They’ve also beaten the teams in second, third and fourth in that run. Pinchbeck fell foul of the Premier Division’s most bang-in-form striker last night. An 18-minute second-half hat-trick from Luke Ball made it seven goals in four days, and 29 goals for the season. There’s an effective battle for third place tonight (May 3) when Netherton United host Moulton Harrox. Ramsey Town will pull three points clear at the top of Division Two if they win at Langtoft United Reserves. Holbeach United Reserves 0, Peterborough Sports Reserves 2 (Barron, G. Gibbs). Stamford Lions 4 (Ball 3, Sheehan), Pinchbeck United 2 (Lawe, Sargeant). Netherton United Reserves 1, Warboys Town 3. Sawtry Reserves 7, Brotherhood Sports 1. Sawtry v Langtoft United (6.30pm). Netherton United v Moulton Harrox (7.45pm). Ketton v Pinchbeck United (7pm).